When new cars hit the country, they are usually parked for a specific period of time in the shipping ports before being transferred to their respective locations. However, no one expected the chemical warehouse located really close to China’s busiest Tianjin port to burst into flames before the vehicles could be transported. While reports indicate that Jaguar has witnessed the highest loss in terms of number of vehicles and its worth, there are plenty of other car manufacturers who face the same issue. During the time of the blast, there were vehicles from Hyundai, Renault, Volkswagen, Mitsubishi, Kia as well as a large number of Land Rovers parked in the lot. The explosion occurred in a chemical plant which prevents authorities from allowing people and company representatives’ access into the zone. They are still busy clearing up the space and ensuring that there are no harmful chemicals in the air. Commenting about the situation, Jaguar said that they are not in a position to reveal the exact number of cars destroyed by the explosion. The company had parked 5,800 Land Rover vehicles in different parts of the port and based on the vicinity of the blast, over 90 percent of these cars are expected to be damaged beyond repair. Jaguar will not incur any loss because the company didn’t pay the taxes for these vehicles to be sold in China. Besides, a compensation for the accident that occurred in the chemical factory will be made and they also have insurance to claim. The biggest problem is that the Land Rovers were supposed to fill up showrooms in multiple parts of the countries where customers are waiting to buy one. It may take a couple of weeks for the manufacturer to ship new Land Rover models from other parts of the world to China and distribute it to customers who have already pre-ordered them. An auto analyst named Piyush Jain commented that such a setback will hardly affect a company like Jaguar because people who want such a luxurious vehicle as the JLR would hardly go back to something else just because shipping was delayed by a couple of weeks. 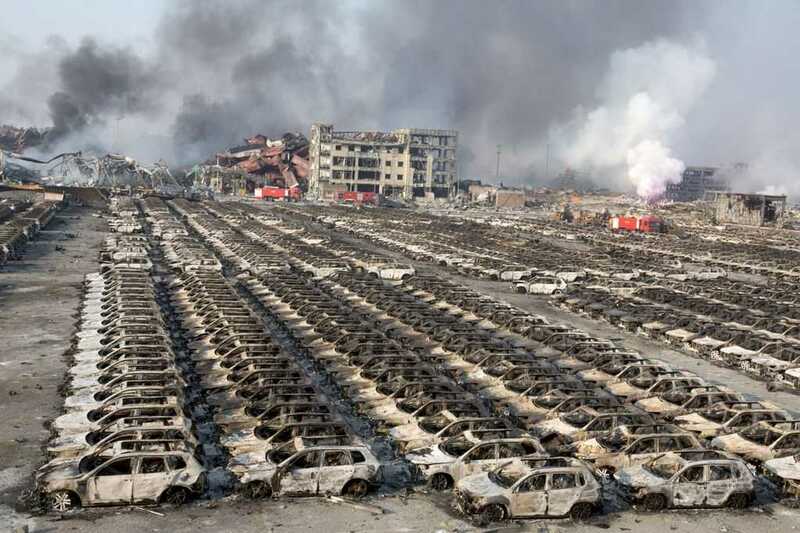 A total collective loss is estimated at $1 billion which includes vehicles from multiple brands parked in the port. The people at Jaguar refused to comment on the loss they incurred. “We are yet to access the location and the damages caused. We can reveal the exact numbers once we gain access to the port,” said a company representative.